"Faithful practices" can help students and others become whole persons of integrity, Samford University provost and executive vice president J. Bradley Creed told a convocation audience Tuesday, Jan. 29. "Character is shaped by practice carried out in a community of people," said Dr. Creed, adding that developing integrity, not unlike learning skills to become expert at a sport or a musical instrument, is best done with other people. "You have to practice to be a person of integrity. 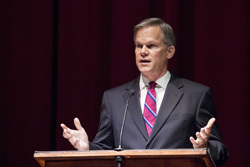 Character is the cause and consequence of what we do and our relationships with those around us," said Creed, speaking at the opening convocation of the 2013 spring semester. Creed noted how a major student cheating scandal recently rocked the Harvard University campus, causing much media attention, internal investigation and analysis as to the root cause. The venerable Harvard institution is not alone in its recent situation observed Creed, citing instances at other academic settings and among individual politicians, athletes and public figures. "The big deal is that such actions don't just hurt those who are directly involved," he said. When a government official, a student, or a Lance Armstrong acts dishonorably, it "tears the social fabric," leading to a general sense of distrust. "And trust is the social glue that keeps everything working," said Creed. Temptations to cheat can come from competition and pressure to be more clever or more accomplished. "Something that will give you a competitive edge over others, such as entrance to medical school or access to the good life as you think it exists," said Creed. "We must all own up to the fact that we are all in need of help," he said, adding that public figures would be better off if they "came clean early and admitted their mistake." The key is to not go it alone, but develop a sense of community. "You don't become a whole person by yourself. The little things you do add up over a lifetime, and college years are important. We are shaped and formed by those around us." The convocation program in Wright Center featured presentation of awards to two faculty members. Religion professor Dr. Penny Long Marler received the George Macon Memorial Award for outstanding performance as a teacher, counselor and inspiration to students. Sociology professor and department chair Dr. H. Hugh Floyd received the Jennings B. Marshall award for significant and sustained service contributions to the university.